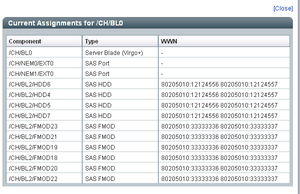 Admin (a) role privileges are required to view Sun Blade Zone Manager allocations in Oracle ILOM. The Sun Blade Zone Manager in Oracle ILOM must be enabled. Access the Sun Blade Zone Manager and click Detailed Setup. For instructions for accessing the Sun Blade Zone Manager, see Access and Enable Sun Blade Zone Manager . 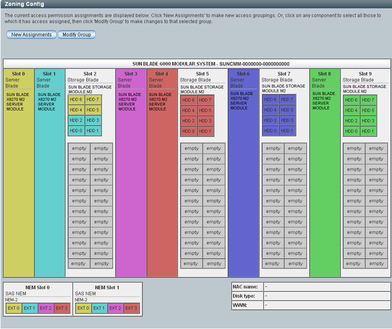 The Zoning Config dialog appears displaying the current chassis storage allocations. Select a CPU blade server slot. For this example, slot 0 is selected. Scroll down to the Current Assignments table. All of the storage resources that are currently assigned to the selected CPU blade server appear in the Current Assignments table. To view, at the same time, the Current Assignments table for the selected CPU blade server and the resource allocations for the other chassis CPU blade servers, click Detach Table. The detached Current Assignments table appears in a separate dialog box.